J-ust M-e: Advice I was looking for...and a giveaway because of it!! Advice I was looking for...and a giveaway because of it!! Can't the unexplainable moments in your life be amazing? How is it that when God can seem so far away, He blows us away with a tangible reminder of His presence!? I mentioned in my post yesterday that it is hard to know what to do at times when we can't see God's plans. Do you accept what is going on and take things as they are or do you continue to pursue and hope in the plans that you dream of? Do you continue to pray or do you move on into the reality of life with unanswered prayers? Let's face it. We all have unanswered prayers. But how many of those prayers did we give up on? How many times have we given up on God? If you give up praying, you have given up on the only one who can answer that prayer. You have given up on God himself. And I am completely guilty of giving up. When prayers don't seem like they are coming to fruition I assume that God isn't going to answer my prayer in the way I want or he isn't even going to answer at all. But I have then made a horrible mistake. I have given up. 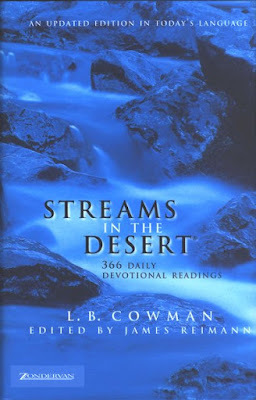 Today I opened my daily devotional, Streams in the Desert, to today's date. This devotional was given to me by my friend Rebecca while I was in the hospital with Liam. It came to me ragged, wearing out and well loved. And I believe Rebecca said it was given to her when she was experiencing some tough times in her life. I want to post today's passage because it is worth the time it takes to type it all out on here. It is worth it to me to reabsorb what it contains and I know it will be useful to you as well. The failure to persevere is the most common problem in prayer and intercession. We begin to pray for something, raising our petitions for a day, a week, or even a month, but then if we have not received a definite answer, we quickly give up and stop praying for it altogether. This is a mistake with deadly consequences and is simply a trap where we begin many things but never see them completed. It leads to ruin in every area of life. People who get into the habit of starting without ever finishing form the habit of failure. And those who begin praying about something without ever praying it through to a successful conclusion form the same habit in prayer. Giving up is admitting failure and defeat. Defeat then leads to discouragement and doubt in the power of prayer, and that is fatal to the success of a person's prayer life. People often ask, "How long should I pray? Shouldn't I come to the place where I stop praying and leave the matter in God's hands?" Pray until what you pray for has been accomplished or until you have complete assurance in your heart that it will be (accomplished). Only when one of these two conditions has been met is it safe to stop persisting in prayer, for prayer not only is calling upon God but it is also a battle with Satan. And because God uses our intercession as a mighty weapon of victory in the conflict, He alone must decide when it is safe to cease from petitioning. Therefore we dare not stop praying until either the answer itself has come or we receive assurance it will come. In the first instance, we stop because we actually see the answer. In the second, we stop because we believe, and faith in our hearts is as trustworthy as the sight of our eyes, for it is "faith from God" and the "faith of God" that we have within us. As we live a life of prayer, we will more and more come to experience and recognize this God-given assurance. We will know when to quietly rest in it or when to continue praying until we receive His answer. I asked yesterday what to do and God showed me this morning! I will continue to pray and wait upon Him. Yes- it is very hard to do. I like to give up. But that isn't an option! This devotional is very inspiring. It is firmly rooted in scripture and it will not only encourage and comfort you, it will give you strength and insight into God's word. Because this book was passed to me in my time of need, I want to pass it along to someone else! I know how much I have benefited from it and I know whoever gets it will too. But, you will get a brand new copy! How do you get one? Just leave a comment on this post and I will randomly select a winner! That's it! Oh- and I will leave the "contest" open for a bit. I know someone is going to benefit exponentially from getting this book and I can't wait to send it out! Wow! Amazing :) If you don't mind, I'm going to post a link to your giveaway on our blog so more people can read your post. You will LOVE Leah. She's an amazing therapist and is so good with Carter. We were there yesterday. We'll be back next Tues, Wed, and Thursday. Jen, you don't know me, but I'm one of Carter's fans--I check the Myers' website about 2-3 times/day because Carter's story came into my life at a time when my feelings and spirit were very vulnerable (in a good way) because I had just given birth to our first son...who was born without any major medical issues. I have been amazed by Carter's strength, and by Kellie and Brad's tireless devotion to their son and what it takes to keep him "going", which I think any parent would instinctually do, but also by how selflessly they share his life with the world in an effort to increase CDH awareness. I was glad to have "clicked" on their link to your giveaway...Regardless of whose hands this amazing book falls into, I will certainly make sure I read this soon...even if it's not me. Your post was amazing. I agree, AMAZING and so true. I'm going to share this on my blog. would you mind if i post a portion of your post in my blog...its so moving! I do have a person locally. She is actually 10 minutes from my home. We wold do a weekend of sessions-2 on Saturday and 2 on Sunday. It is expensive since it is not covered with insurance. I too am struggling with my Micro's problems perhapse if I do not win this drawing I can obtain this book elsewhere to help me.. I just crossed your blog thur anothers...yes God is wonderful and does remind us of his work everyday.. I would love to be included in this giveaway. That book seems amazing. Kennedy was admitted to the PICU this morning and sometimes it is just so hard to stay positive. 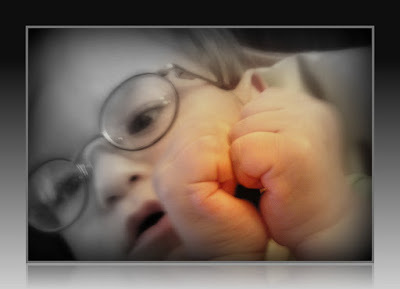 Glad you commented on my blog--your little boy is a cutie! !